Elizabeth looks back on how she met her beloved husband, Patrick. "I found him first," she says. "I was scared to approach him, being raised in African cultures. We always believed men are the one who approaches a lady, but that did not happen in my case. When I saw Patrick's picture, I took a risk by Flirting and favorited him. I was surprised when he replied with a text in which he said he'd been waiting for me." Elizabeth says a specific thing inspired her to try online dating. 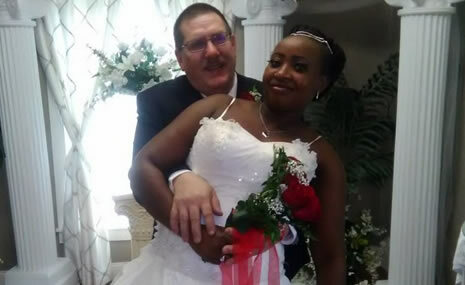 "I wanted an interracial relationship. I had tried different sites, but luckily, your site was the one!" 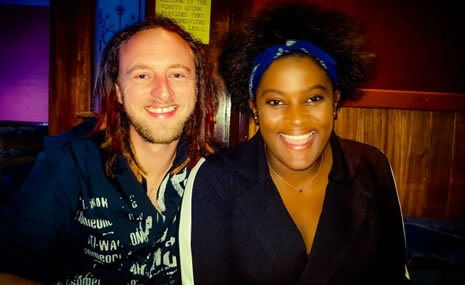 Patrick joined us because, as far as he knew, "it was the only dating site that connects interracially." Both singles say they were confident Internet personals could work for them. A month after posting a profile with the username "FatPatWill," Patrick received a Flirt from "Utugi," who'd signed up two weeks earlier. We asked Utugi (Elizabeth) what sparked her interest in him. She remembers thinking, while reviewing Patrick's profile, "He looks honest and serious." He responded to her because "her pictures look innocent, and she was specific about what she wanted." He thought she was out of his league, too. That's why he asked her, "Are you interested?" He just couldn't believe it. Patrick tells us, "She replied to me, 'That's why I flirted and favorited you!' We chatted online, and she asked me my number, and when we started talking she was all I needed." Before long Elizabeth felt ready for more. "After video chatting and phone calls, I trusted him and I was ready to meet him." Their communication confirmed his impression of her, too. "Immediately, when I heard her voice and video chatted with her, I saw she was the way she looks in her pictures," says Patrick. "And I was ready to meet her, too." Elizabeth tells us how that happy milestone came to pass. "He flew from Washington to Missouri. When I went to meet him at the airport, he hugged and kissed me!" Patrick chuckles in assent. "I couldn't resist! My heart pounded and was filled with her love." She was happily surprised to discover facets of the guy that his profile didn't capture, namely, "His kindness and truthfulness." She also found Patrick's profile pic misleading. "He looked serious in his only profile picture, but he is open and funny!" You won't believe the big surprise she got after this initial meeting in Elizabeth's neck of the woods. "He knelt down and asked, 'will you marry me?' Then he slipped an engagement ring on my finger." Patrick is happy to report her answer. "She said yes!" Elizabeth says she had no second thoughts about the fast-tracked engagement. "He is everything I was searching for!" She says she knew he was serious "when he decided to move and transfer everything from his state to my state." Patrick will never forget the moment he realized he was ready to make that kind of commitment. "When she accepted me and encouraged me, giving hope when I needed some." Of course, every relationship faces a degree of challenge, which tests partners' commitment to each another. "Distance, and discouragement because of our age difference" posed problems, reveals Elizabeth. Patrick adds "my family, and race" to the list. But there was no way these speed-bumps could keep them from reaching their destination. As a matter of fact, the next time they saw each other, they tied the knot. "I flew over again, ready and prepared to marry her," Patrick informs us. "I surprised her and, on Valentine's Day, I married her!" He truly enjoys spending time with his new wife. "She is always happy," he says. "She is humble, a good listener, respectful and hates arguments." Something else he appreciates is that she's "transparent" about things, so he always knows where he stands with her. Elizabeth appreciates that Patrick is a "very encouraging and comforting" partner. "I became very happy [after meeting him]," she notes. This is the advice Elizabeth has for everyone out there. "Online dates are real, if you meet real and serious people. So don't give up, and if you ARE real, you will GET real." She has a specific message for the gals out there. "Ladies, take that step to approach someone, like I did. You never know how this approach will bring a difference in your life... Another thing ¬- stick with it, and be truthful with yourself about who you want." "Don't judge a book by its cover," says Patrick. "I didn't believe she could be interested in me, when she first Flirted with me. I decided to reply and open my heart, and now she has brought hope to my life." Here's what he says about the obstacles you may face. "Don't listen to discouragements! Follow your heart and take a risk." You have little to lose and everything to gain. 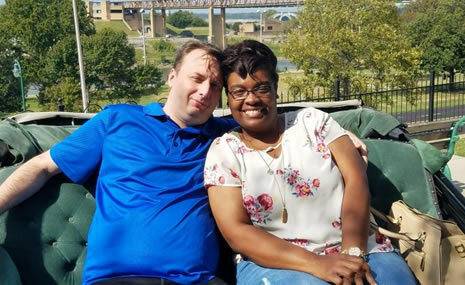 9 responses to "Distance and Discouragement Didn't Stop Them"
We are very happy and loving couple I personally I can't complain God gave me what I wanted am encouraging every one to hold on On Valentine's day we are celebrating our 1st anniversary. Mr & Mrs Williams...... Wishing you all the best in your search. Take a risk... Love that! I just joined and so far things not looking so bright for me because most of the men i met so far is not serious.plus i am in the Carribbean so long distant is another hurdle.i guess i just have to keep trying.congrats to all the happy couples with success stories. Absolutely beautiful. My first husband was a Patrick and he knew exactly what he wanted. Good Luck and Many blessings. May your marriage outlast your breaths. This definitely gives me hope... You two make a beautiful couple. Congratulations on the marriage.